Wall air conditioners are useful because they are easy to install, take up little space, and help to keep a room cool. Since there are so many wall air conditioners available on the market this year, you might have trouble finding the best one. We’ve decided to perform some extensive research in order to find the most high-quality and efficient through the wall air conditioners being sold right now. In our selections, we have carefully considered the unit weight, BTU, noise level, user ratings, and cooling capacity. Keep reading to find the best wall air conditioners for your cooling needs. This LG air conditioner can cool at an impressive rate of 11,500 British thermal units (BTU). It has a sleek profile that keeps it from looking too bulky in most rooms. It requires a 230V electrical outlet as the unit can’t function with a regular 115V one, but is a reliable wall air conditioner overall. It has 3 cooling or fan speeds that make it fit for any environment and enable it to effectively cool down a room without causing too much draft, which is why we consider it one of the best wall air conditioners on the market. 12,000 BTU cools spaces up to 550 sq. ft. The ready-select controls on this Frigidaire unit let you easily choose your fan speed and cooling level. The four-way air direction design lets you adjust the unit to blow air in any direction. In addition, it also comes with a dehumidification function that can pull 1.8 pints of moisture per hour, making it one of the best wall air conditioners on the market. The electronic 7-step temperature limiting system in this wall air conditioner keeps it from over-cooling a room. It is a packaged terminal design that may be suitable for areas where traditional through the wall units are not ideal. 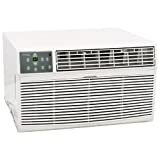 Although an older model, this is one of the best wall-mounted air conditioners on the market. NOTE: This item is currently unavailable, but you can find a similarly powerful through the wall air conditioner on the official GE website. The full-featured remote and LED display on this air conditioner make it easy to adjust the temperature to your needs. Also relevant is the fact that it has three cooling speeds and three fan modes, which make it a customizable wall air conditioner. At 12,000 BTU, this Frigidaire air conditioner keeps your room nice and cool. It is easily operated with a control panel or a remote that lets you set the AC with just a few button pushes. 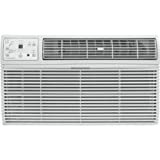 According to ratings and reviews from verified customers, this is the best wall air conditioner currently on the market. Note: If you’re looking to cool a smaller space, make sure to check out our article on the 10 best low profile air conditioners. This Keystone air conditioner comes with a temperature sensing LCD remote for easy adjustments. It has three manual cooling speeds along with an auto cool option. It can remove up to 2.3 pints of moisture per hour from the air and comes with a temperature-sensing remote control that allows you to control the temperature and fan speeds from a distance. This efficient wall air conditioner has an estimated yearly energy cost of just $83. 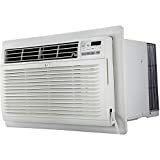 Furthermore, it has a sleek white design that matches any room design, a programmable timer, and an anti-corrosion coating, which makes it one of the best wall air conditioners on the market this year. With the capability to dehumidify up to 60 pints a day while heating or cooling your room, this is a very versatile option. It has 4 operating modes and 3 fan speeds so you can be sure you can customize the way it works according to your needs. The Koldfront air conditioner also comes with a remote control for convenient usage, making it one of the best wall air conditioners when it comes to ease of use and convenience. With this air conditioner from Garrison, you can both heat and cool your home. Some of the great features of this product are the electric control panel with digital display and the auto-restart function, which allows the system to automatically resume operation in case of a power loss. Note: Interested in more energy-efficient ACs? Check out our collection of the best energy efficient air conditioners on the market in 2019! You can easily cool your room with this powerful air conditioner that has a BTU of 10,000. When external temperatures drop below 45 degrees, it can also work as a heater to keep your home comfortable. It also has a dehumidification function that can remove up to 3.5 pints of water per hour from the air. 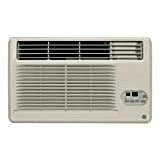 All of these air conditioners can easily be mounted on or through a wall and they are certain to cool averagely sized rooms. 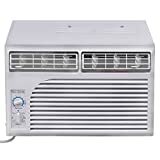 Some of the best wall air conditioners also have practical extra features like heaters or dehumidification. Make sure to leave a comment below to let us know which one of these wall air conditioners is your favorite.